Dave McKenna's definitive Snyder takedown was a thing of beauty; go re-familiarize yourself with it now. But the letter to Washington City Paper on behalf of Snyder is a piece of work in its own right. 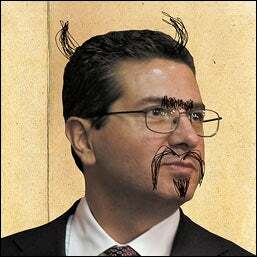 The anti-Semitism claims come from the cover drawing, a photo of Snyder "defaced" with horns and diabolical facial hair. In other words, the Devil (with a unibrow). Every single person viewing it, save one, got that. That one was Snyder, who claims he was "vilified by an anti-Semitic caricature...Such images have been used to demean Jews since the middle ages." No! You can't put that aside! That's a hell of a lot more racist that doodling Devil horns on your photo, and you can't cry foul on one and "put aside" the other! 1. Snyder Communications settled the suit from Florida's attorney general for $3.1 million for switching people's long-distance providers without authorization. In addition to having to reimburse the people the screwed, their direct marketing service was forced to shut down and cease all operations in the state. But, as part of the deal, Snyder communication was able to agree to the punishments "without admitting any wrongdoing." 2. Snyder sold the company before the settlement was reached, but long after the practices which brought the investigation and allegations in the first place. It seems Snyder's main defense for many of these claims, including the telemarketing fraud and the Six Flags mascot search, is that "no owner/CEO/Chairman of a multi-national/billion-dollar" operation would personally be responsible for the day-to-day actions of their company. Snyder claiming a hands-off approach is laughable in the wake of his firing of Norv Turner, the hiring and firing of Marty Schottenheimer, the signings of Deion Sanders, Jeff George and Bruce Smith, the hirings of Steve Spurrier and Joe Gibbs, adding a "security surcharge" to Redskins tickets after 9/11, charging to watch preseason workouts, bringing on Six Flags investor Vinny Cerrato, running a smear campaign against Gregg Williams because Snyder wanted Jim Fassel instead, personally calling and threatening Laveranues Coles, banning signs from the stadium, and having vanilla ice cream sent to his DC's office to passive-aggressively complain about his boring schemes. Dan Snyder, I think Redskins fans would like to believe your defense. No one would celebrate harder and louder and longer than them if you indeed took a hands-off approach with the Redskins.